Anchorman Inspired "San Diego Chargers"
This week’s announcement confirming an Anchorman sequel is kind of a big deal. 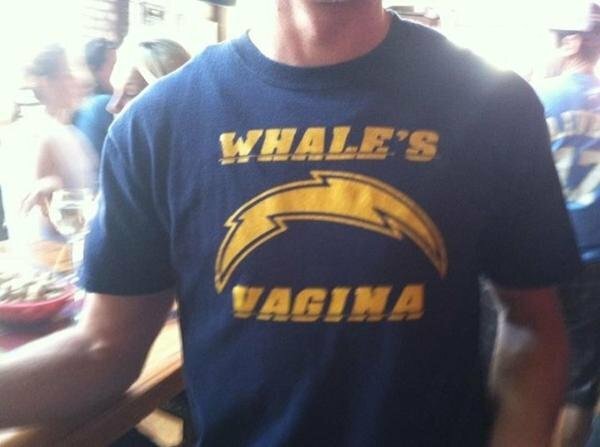 Show your support with this classy mash up tee featuring the translation of the German word “San Diego” and the Chargers bolt. You can find it on ebay, but unfortunately they don’t have a “buy it now” option. Not a bad deal at $8.99, but I wouldn’t pay more than $15. Threadless "UC Berkeley: Stay Golden"
College pride (and betting) is at a high with March Madness in full swing. Although I’m not a fan of UC Berkley or any of the teams that are featured in the “Threadless loves College” collection, I think the designs rock compared to the generic fan gear you would find at a campus store or online. Most of the shirts are football themed, but they may not be available by the time next season rolls around.